Fast Company is growing wary of hot desking. Find out why! What’s the difference between co-working and shared office space? Commercial Cafe explains. WeWork Blog shares a story about an algorithm that might design your next office. 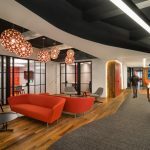 Every generation or two, culture (and consultants) drive workspace design in a new direction. Quartz examines perhaps the most reviled of these trends, the cubicle.